This past weekend I went to the Metro Cooking and Entertainment show in DC. It was a day filled with battling crowds in Washington Convention Center for a tiny sampling of olive oil or cheese. It was an interesting day and I left with a few goodies, but I was hoping that the should would be a little more gourmet. There were about 5 different vendors selling overly sweet slushy mix for wine and of course Bath Fitters was there (they seem to be at every convention no matter what the theme–I’ve also spotted them at an antique show and a golf show). Not the most attractive decor element–but I’m willing to deal for fresh mushrooms. When you open the box it looks a bit strange… the soil is used coffee grounds. I have to soak the seed/soil bag overnight after cutting a “T” shape in one side. Then I mist the package twice a day and in 10 days I am supposed to have oyster mushrooms. Each kit will regrow mushrooms four times. 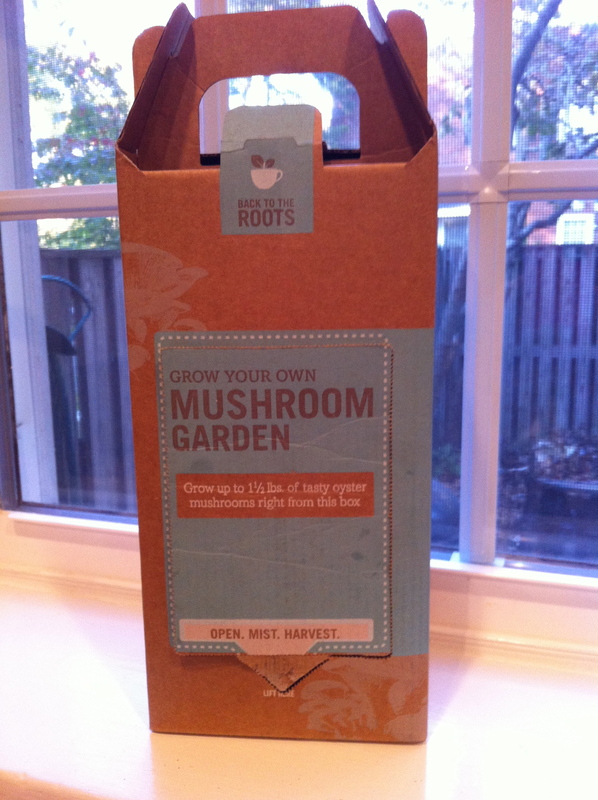 I’ll update you when things start growing–in the meantime any suggestions for oyster mushroom recipes? Sadly, I did not really get any mushrooms… I followed all the directions and weeks later there was still nothing. Since the results are guaranteed I contacted the company. This was around the busy holiday time so when I got an email back from an employee asking me to send her a picture of my dirt box so we could “troubleshoot” it, I was a little peeved. I just wanted a new bag of dirt and seeds since mine was clearly a dud. I ended up getting busy for the holidays and never contacted her. Plus I didn’t feel like “troubleshooting” my dirt. Then I got mad looking at the ugly $27 box of dirt in my window and just threw the thing out. Oh well. It’s a good idea, but I wouldn’t recommend it. So, did you get mushrooms? I didn’t! It was disappointing, but I updated the post with the full review.